Deep in the heart of a hollowed-out asteroid, The Doctor and his companions - socialite Polly Wright and sailor Ben Jackson - stumble into the middle of a military exercise. More, they stumble across a mystery - ten alien corpses, belonging to the most wanted anti-human terrorists of the era. 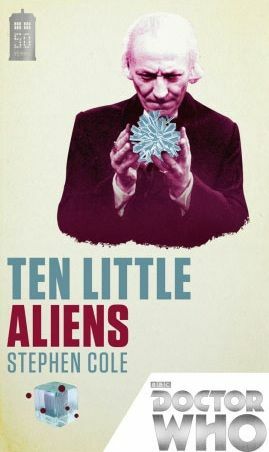 When I read the introduction to Ten Little Aliens, I began to dread reading further. According to author Stephen Cole, his original pitch for this book was summed up, rather neatly, as "Starship Troopers meets Agatha Christie". For someone like me who loathes militaristic science fiction in general (Heinlein in particular) and is generally indifferent to the parlor mystery genre, there is little - save the phrase "Written by Stephenie Meyer" - to turn me away from a work of fiction faster. Apart from my desire to read all of the Doctor Who 50th Anniversary Collection of novels, only one thing kept me going - the fact that the companions in attendance for this tale were Polly and Ben. I've found the two of them oddly compelling ever since I saw The War Machines and was saddened to discover that most of the episodes featuring the young couple were lost in time along with much of the rest of the later First Doctor stories and early Second Doctor stories. Thankfully, Stephen Cole does a fine job of capturing the character's voices and not descending into cliches. There is a tendency in some Classic Who stories for the male companions to be dumb muscle that exist only to protect The Doctor from physical threats as the female companions' only purpose is to scream at the monsters and be rescued. While Polly and Ben do fill these roles somewhat, they also go beyond simple stock characters. At first Polly seems to be a girly girl whose chief moment of excitement in exploring an alien world involves her discovery that The TARDIS has a number of space suits in designer colors but she is shown to be an intelligent and resourceful young woman as well as a fashionista. Similarly, Ben fits the scrapper profile save for the fact that he is of below-average stature and is determined to prove that he can make up in heart what he lacks in height. Shockingly, Cole's script also manages to avoid cliches in other regards. Admittedly, the first fifth of this book reads like a dreadful Starship Troopers fanfic overlapped with a slow Doctor Who episode. There's even a roster of the soldiers, complete with faux-patriotic quotes about this universe's equivalent of the bugs - a necessary evil, as you'll have a hard time telling the soldiers apart at first without it. And, of course, we have the requisite scenes of the soldiers not trusting The Doctor and company but gradually coming to release that We Are All In This Together. However, things start moving beautifully once the danger is established and the soldiers begin splitting up to figure out just what is going on. By the time the third act begins, the reader will be well and truly involved in the action of the piece. It is here that Stephen Cole adds yet another literary device into the mix - a Choose Your Own Adventure style section of the book, where the reader jumps between the viewpoints of multiple characters and sees the action through their eyes as multiple events occur simultaneously. This gimmick works far better than it has any right to, which is a fair statement about this book in general. It combines two sub-genres driven by cliches that have no business being mixed. And yet it works. It all works. Somehow, in defiance of all logic, this book works. As such, its well worth slogging through the slow start to get to the excitement at the end.